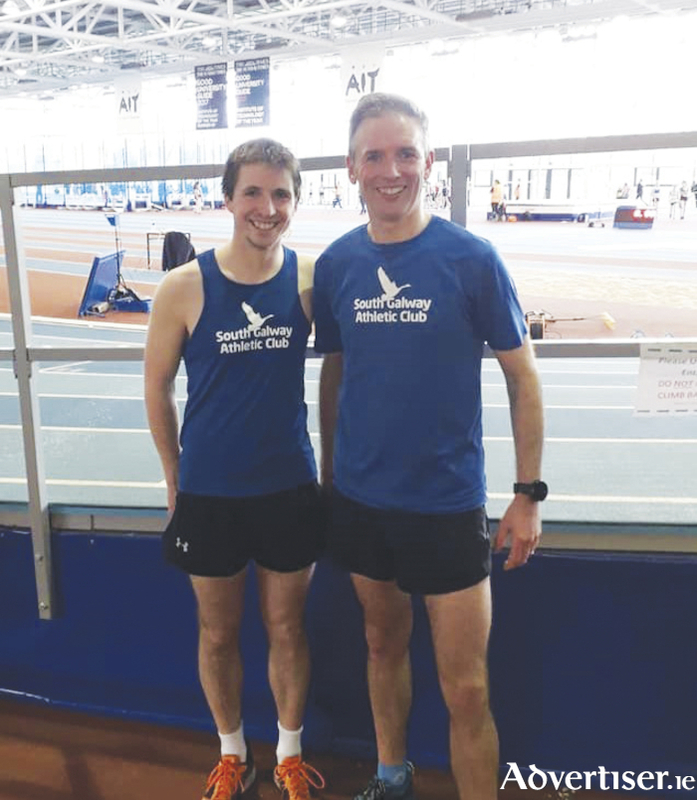 Indoor champs: Dave Richardson, bronze in the senior 3000m (left) and Greg Lundon, Masters 3000m champion, both of South Galway AC. A record entry of 1,000 athletes from all Galway clubs competed at both juvenile and adult level at the 2019 Galway Indoor Championships at Athlone IT Arena last weekend. At senior level, Kevin Mooney of Craughwell AC proved the class of the field when winning an enthralling men’s 3000m in 9.28, with Patrick Noonan of Craughwell AC in second, and Dave Richardson of South Galway in third. Aisling Joyce of GCH had a fabulous run to clock an excellent 10.15 for a victory in the women's race, after a great battle with clubmate Regina Casey in second, with Kathryn Casserly of GCH third home. Niamh Hennelly won the senior women's 1500m, and Jack Maher looked strong in taking the men’s county title in 4.12. Seamus Leddy of GCH took the senior men’s race walk win with ease. Over 800m, Jack Miskella of Craughwell ran 2.05 to claim the men’s title after a superb race with clubmate Arlene Earls, who claimed the women's gold. At juvenile level, Sean Hoade of Craughwell won double gold at U12 level, claiming the long jump and shot putt titles, while Emma O Donovan of Craughwell AC also impressed winning double gold in both high jump and long jump. Not to be outdone, the talented Ben Moran of GCH won on the double also, taking victory in the sprint hurdles and high jump. The U12 hurdles girls' title went to Jessica Kay of Galway City Harriers, while the shot putt was won by Ruby Casey of East Galway AC. The 60m sprints were won by Elisa Jaime Stapleton of GCH and Tuam AC’s Jeremiah Oifoh. In the longer distances the 600m titles went to Aisling Geaney of South Galway and Conor Faherty of GCH. AT U11 level, The 60m sprints were won by Tuam AC's Clodagh Gannon and Tom Henry, who claimed a second gold in the long jump, with Lauren Morgan of Craughwell AC taking the girls' event. The 600m titles were won by Grace McGrath of Tuam AC and Stephen Joyce of Craughwell AC . In the U10 events, the 60m sprint titles went to Sarah Donald of GCH, who also won the long jump, and Eanna McGrath of Tuam, Oisin O'Donovan of Craughwell AC was victorious in the boys' long jump. The 400m titles were won by Eimear Fallon of Tuam AC and Alan Hallinan of Craughwell AC. AT U9 level, both girls' 60m and 200m titles were won by Elizabeth Healy of Clare River Harriers AC, while Daisy Griffin of Loughrea AC won the long jump. Felix Igoe Fahy of East Galway AC won the 60m, Darragh O Donnell of Craughwell AC took gold in the 200ms, and Eoin Mooney of Tuam AC won the long jump title. The relays went to Tuam AC in the U10 boys, U11 girls, U12 boys, GCH in the U10 girls, while Craughwell AC won the U11 boys and U12 girls. At U13 level the 60m titles were won by Danielle Moynihan of Tuam AC and Enda Keane of East Galway AC. Amy Rose Kelly of South Galway AC won the sprint hurdles, Aine Maguire of Tuam AC won the 600m distance race, and Darragh Fahy won double gold in the 60m and sprint hurdles. In the U14 events the 60m titles were won by Aoibhe Donnellan of Craughwell AC and Cian McNelis of Athenry AC, while Chloe Hallinan of Craughwelll AC and Evan Moran of GCH won the sprint hurdles over 60m. Siobhan Geaney of South Galway AC won the 800m distance gold, Danielle Fitzpatrick of Tuam AC took gold in the 1k walk, and the 800m title was won by Michael Burke of East Galway AC. David Mannion of South Galway made it a clean sweep, with triple gold, in the U15 events. The impressive Mannion won the 800m title, and showed his versatility over the shorter distances, winning both the 60m title and sprint hurdles. Sean Kelleher of South Galway AC took gold in the race walk. Sophie Farrell of South Galway AC won gold in the 60m, while Ava McKeon of GCH won the sprint hurdles, Fauve Aylmer of Craughwell AC won the 800m distance race, wand Ciara Crossan of South Galway AC won the 1k walk. Emma Moore of GCH was dominant, winning both the 200m and 800m races in the U16/17, while the 60m titles was won by Nicole Quirke of GCH, and Saoirse Moore of Craughwell AC took gold in the sprint hurdles. Emily Miskella of Craughwell AC won gold in the 1500m, with Roisin Geaney, South Galway, winning the Walk. The boys' 200m title was won by Shaun Gilligan of Galway City Harries, Conor Hoade of GCH won double gold in the 60msprint and also the hurdles, while Craughwell dominated the middles distances, as Ross McGuinness setting a championships record winning over 1500m, and the improving Oisin Davis won the 800m. In the field, Brendan Staunton and Chloe Casey of GCH claimed the senior shot putt titles. At juvenile level, Jack O'Shaughnessy of Caltra (U13 ), Eoin Higgins of Clare River Harriers (U14 ), and Liam Shaw of Athenry,with a new record (U15 ), Daniel Ukaga of Loughrea (U16 ), and Joe Mears of South Galway AC (U17 ) were victorious. The girls' titles went to Tara Keane of GCH (U13 ), Niamh Duffy of Craughwell (U14 ) Aoibhe Fahy of Craughwell (U15 ), Anna Donoghue of Caltra AC (U16 ) and Aibidh Ni Mhaille of GCH ( U17 ). GCH achieved the double in the long jump at senior level, Chloe Casey winning a second gold, and Richard Kamsen winning the men’s title. Richard McGrath of GCH (U13 ), Ethan O'Brien of Craughwell (U14 ), Stephen Mannion of South Galway (U15 ), and Conor Hoade of GCH (U16/17 ) were winners, while Katie Flaherty of South Galway (U13 ), Grace Keaveney of Craughwell AC (U14 ) Erin Kelly also Craughwell (U15 ), and Sophie O'Brien, of Craughwell (U16/17 ) were the winners in the girls' events. Brendan Lynch and Leanagh Gilligan, of Craughwell, took the triple jump titles; Shane O'Rourke of Tuam AC and Laura Cunningham of Craughwell won the senior high jumps; Saoirse Moore (Craughwell ) and clubmate Lucas Schukat took the U16/17 titles; Tuam's Danielle Moynihan claimed a second gold of the day in the U13 Girls, Ethan O'Brien of Craughwell did likewise taking a second title in the U14 boys high jump, Grace Bermingham of South Galway (14 ), and Evan Hallinan of Craughwell (U15 ) were also winners. Lukas Schukat at U16/17 and Cian Lavan in the U15, both competing for Craughwell AC, won the pole vault events.